Recently a fellow German blogger asked me to do a little interview. One of the questions was: “Where do you get the inspiration for your recipes?” I had to think quite a while before answering. Most of the time my inspiration comes out of nowhere. I have a certain ingredient in mind and then I start thinking about what to make from that ingredient and how to serve it. I think about new flavour combinations, colours, and themes. But for this recipe the first inspiration did not come from my head, it came from my daughter. She loves us to read her books and she listens to audio plays. Among her favourite stories are Pettson and Findus. Findus, the cat, loves pancakes and Pettson, the old man Findus lives with, makes them for him all the time. In one of the books there is a picture about how exactly they are made: in a cast iron pan with about six to eight indentations. Once F saw this, she wanted pancakes for breakfast every morning. But she wouldn’t let me make them alone. She wanted to help and she had very precise thoughts about how they should look like. “First”, she told me, “we need maaaaany ingredients. And then we need to stir them.” So we added all of the ingredients to a bowl and F stirred. Then she said I was not allowed to make large pancakes. “Findus only eats small pancakes.” And to make sure I wouldn’t cheat, she dragged a chair in front of the stove and climbed up to check. This is how I cook in my kitchen these days, people! I have fierce competition and supervision. After all these pancake mornings I thought about changing things up a bit. I tried to think about pancakes in a different context and with warm, wintery ingredients. Buckwheat flour came to my mind first, because of its quite unique rustic and earthy flavour. In my opinion it’s best highlighted in savoury foods so I wanted to make sugar-free pancakes. Then I thought about different meal types. If we can have pancakes for breakfast, why not for lunch as well? And then complementing flavours came to my mind, which would have to be quite wintery as well. Sunchokes (Jerusalem artichokes) are a wonderful and aromatic winter vegetable. They taste sweet, earthy, and nutty at the same time and to enhance all these flavours, they should be roasted. Just like buckwheat flour they have a very unique taste both are so differerent that they are not competing each other. The pancake recipe was adapted from this sweet version and it was quite easy to veganise. There’s no need for an egg replacer but since the recipe calls both for an egg and yoghurt, I added some blended chickpeas into the batter to make up for it. 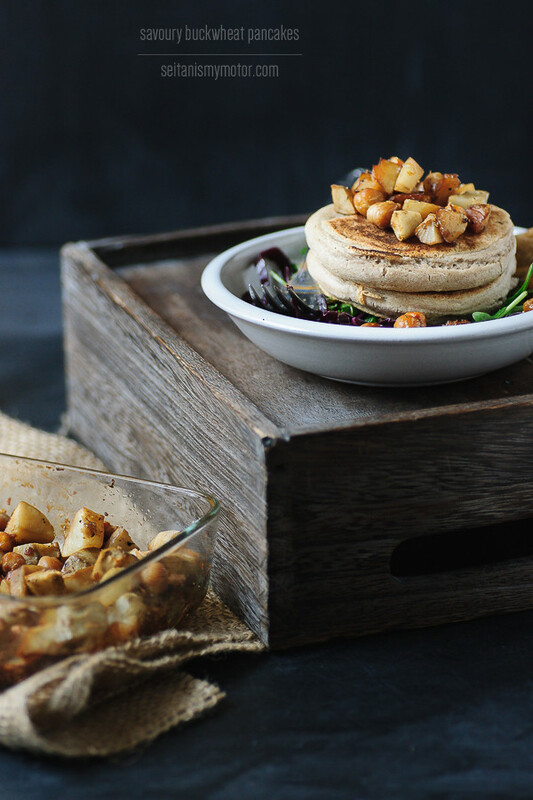 Both the pancakes and the vegetables are seasoned with fresh ginger, which makes the dish a little bit hot and you can leave it out if you are serving this to kids (or other people) who are sensitive to heat. For the pancakes: 180 g (1 1/2 cups) buckwheat flour 1 tablespoon cornstarch 2 teaspoons baking powder 1/2 teaspoon salt, or to taste 2 teaspoons grated ginger 2 cloves garlic, grated 360 ml (1 1/2 cups) water 90 g (1/2 cup) canned chickpeas, rinsed and drained oil for frying Instructions: Place flour, starch, baking powder, salt, ginger, and garlic in a bowl and mix well. Combine water and chickpeas in a blender and purée until smooth. Add wet ingredients to dry and mix until the batter is smooth. Preheat a large pan and brush with oil. Use a serving tablespoon and place about 1 1/2 – 2 tablespoons of batter in the pan. I usually cook three pancakes at once. Cook until the pancake is lightly browned and flip around. You can keep these warm in the oven until ready to serve or you can reheat them in a toaster. For the roasted sunchokes: 300 g (10.6 oz or 2 cups cut pieces) sunchokes, peeled and cut into cubes (1 cm or 1/2 inch) 90 g (1/2 cup) canned chickpeas, rinsed and drained 1 tablespoon oil 1 tablespoon soy sauce 1/2 tablespoon liquid smoke 2 teaspoons grated ginger 2 cloves garlic, grated salt and pepper to taste Instructions: Preheat oven to 200°C (400°F). Combine all ingredients in a small oven save dish and mix well. Bake for 45-55 minutes or until the sunchokes are soft. stir from time to time and season with salt and pepper once the vegetables are done. Serve over pancakes with a salad on the side. I love savoury pancakes – though have never got into jersalum artichokes – they are one of those vegies that seem to go out of season again before I can summon up enthusiasm for them. That pettson and findus book sounds very endearing. A pancake eating cat is something sylvia would love. She loves her pancakes too. Cooking with F sounds like so much fun! :) I rarely bake with buckwheat flour (I have a box of it that I’ve been reserving to make poffertjes) but I’ll have to try it in a savoury recipe sometime. The roasted sunchokes and chickpeas sound lovely too. Your daughter is so sweet. It’s great that she wants to help out (or rather supervise)! :) I’ve never had sunchokes before. I’ve seen them at the grocery store but didn’t buy any. What do they taste like? I like how you used the burlap and the wooden box to create a rustic look. Beautiful! als Mitbewohnerin eines roten Katers kann ich deine Tochter nur zu gut verstehen – der Willen eines Katers nach Pfannkuchen ist wirklich ansteckend! Deine Kreation sieht einmal mehr wunderbar aus und erzielt bei mir die gleiche Wirkung, die Findus’ Pfannkuchen auf F zu haben scheinen..
Da F noch nicht selbst lesen kann, ist sie vermutlich im Kindergartenalter – vielleicht kennt ihr ja die Bücher von Leo Lionni schon, ansonsten kann ich sie dir nur ans Herz legen (allesamt – und das sind einige mehr als bekannte Geschichten wie “Swimmy”). Meine liebsten Kindergeschichten stammen zudem aus der Feder Astrid Lindgrens – bezaubernde Geschichten, die so viel mehr enthalten als den Frieden, den sie oft ausstrahlen (sollen). Die liebsten Bücher meiner Schwester waren dagegen die Geschichten von Winzig, dem kleinen Elefanten. Jetzt hänge ich noch ein wenig den Gedanken an längst vergangene Tage nach und ziehe noch einmal die alten Bücher aus dem Regal, das sie noch immer zieren. Ja, F ist drei. Von Lionni haben wir den Buchstabenbaum. Ich fand seine Bücher im Kindergarten auch immer sooo toll. (Auch heute noch.) Und von Astrid Lindgren haben wir die Märchen als Hörbuch, das ist mein Lieblingskinderbuch. Viele Geschichten sind auch düster und traurig, wie Du schon sagst. Da ist viel mehr drin und deshalb finde ich sie auch sehr empfehlenswert. Pippi Langstrumpf kennt sie natürlich auch und wir erziehen sie in ihrem Geiste:) Ich sehe schon wir haben den gleichen guten Geschmack. Das mit dem Stapeln habe ich natürlich auch genau da geklaut:) Jetzt brauche ich nur noch Hosenträger und einen Hut, dann nennt meine Tochter mich Pettersson.